The property housing the successful Boundary Mill Stores in Rotherham has gone up for sale, with a guide price of £14.5m. The largest quality mill store of its kind in the UK, the expanding Lancashire-based retailer became the new occupier of the former Big W store at Catcliffe in 2012. The 130,000 sq ft store had been empty since Woolworths went into administration in 2008. Agents, Knight Frank have been instructed to advertise the freehold of the prominent 11 acre site as a prime open A1 retail warehouse investment. A corporate acquisition of the property is also possible. 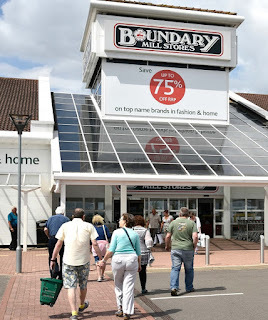 Boundary Mill Stores are owned by Libra Textiles Ltd who trade from five locations with sales in excess of £150m. The stores offer branded goods at discount prices. Departments include ladieswear, menswear, homewares, gifts, books, dvds, arts and crafts and perfume and cosmetics. The company operates a concession partnership where brands reatin ownership of the stock and Boundary Mill Stores allocates space on the basis of prospectives or actual sales and receives commission for the provision of the space in the retail environment and sales support services. Investing around £5m in fitting out the Catcliffe store, the tenant terms are shown with rent at £925,000, uplifting every five years, with 25 years remaining. The price of £14.5m represents a net initial yield of 6%. Including over 1,000 free car spaces, the adjacent Morrisons store has been earmarked as in the path of the proposed HS2 route through to the South Yorkshire station location at Meadowhall. Hahaha,got to laugh.Catcliffe near Sheffield.Seems Boundary mill dont want to be assosiated with Rotherham.Wonder why?Come on RMBC stand up for the town,strike back,start advertising Meadowhall near Ritherham!